Check out Hotel Cassiopeia this week. The play is Charles L. Mee’s whimsical and enigmatic exploration of the shadow box artist’s mind Joseph Cornell. Cornell, famous for both the nuanced juxtaposition of found objects in his art as well as his eccentricity, lived a largely reclusive life with his mother and invalid brother Joseph in the basement of their home in Queens, New York, until his death in 1972. Mee’s play at Single Carrot Theatre dances between actual excerpts from diaries and letters, classic movie dialogue (“To Have and Have Not” and “Algiers” , and imagined scenes between the artist and several of his inspirations. Cornell had a tendency to observe the lives of others rather than engage directly, and Mee imagines his interactions with ballerinas, waitresses and other women with whom he was never able to obtain a relationship, as well as his overbearing and stifling mother. Mee’s play is ambitious in its goal – to reveal the inner-workings of the mind of a great artist. The link between Cornell’s thought process and actual production of art has been criticized by some as nebulous, more style over substance. But the connection between events and people in the artist’s life and the actual shadow boxes themselves can be revealing for those with a perfunctory understanding of Cornell, but is too esoteric for a neophyte. And it’s probably unhelpful for the true Cornell aficionado. Mee’s play may fall short of its ambitions, but Single Carrot gave a rather inspired production of it under the direction of Genevieve de Mahy. Single Carrot’s intimate set-up is a natural starting point, with a background-set painted blue and white like the star constellations appearing in Cornell’s work. Different corners of the rooms were re-created as shadow boxes. Just as many of the objects in Cornell’s boxes were meant to be handled, the audience was encouraged to touch and feel the set before the play began. The characters moved in and out of the boxes to illuminate their direct inspiration on Cornell’s art. Nathan A. Cooper gave a superb performance as the shy, reclusive Cornell – sweet and hopeful yet trapped somewhere between his basement and his mind. The rest of the cast also gave nuanced and meaningful performances in their various roles – Nathan Fulton (herbalist/Matta/corkmaker), Rich Espey (pharmacist/Gorky), Gina Braden (mother, Lauren Bacall), Alix Fenhagen (waitress, Marianne, Leila), Paul Diem (astronomer, Duchamp) and Katie Rumbaugh (ballerina, girl). 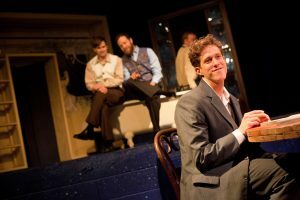 Hotel Cassiopeia runs through April 29. Performances are Thursday, Friday and Saturday at 7:30pm, Sunday at 2:30pm. Single Carrot Theatre, 120 W. North Ave (at Load of Fun), Baltimore, Md. $10-20. 443-844-9253.www.singlecarrot.com. Stephanie Taylor moved to the Washington/Baltimore area straight out of journalism school more than a decade ago. Originally drawn to the bright lights and murky glamor of politics, she quickly discovered she'd rather be writing about stage lights. Theater became her first and most beloved beat. Throughout her career, she's covered everything from international affairs to pop culture for outlets such as The Washington Times, the Online NewsHour with Jim Lehrer, the Scotsman.com, the DCist, the LAist, and more. Contact the author.